My older daughter is not big on conflict and risk in her entertainment. I sometimes joke that if there is a plot, she doesn’t like it. That isn’t fair, of course. She just doesn’t like things that scare her. However, she loves to read and reads quite well. This can present a problem, as we have to search for books that will be at the right reading level but not have content aimed at older kids, or just at kids who are more comfortable with scary things. 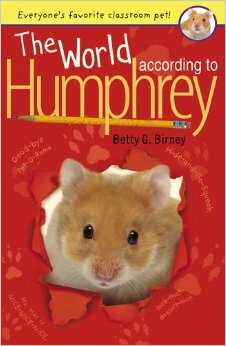 The Humphrey series of books from Betty Birney is the first series we’ve found that we all love. Humphrey is a class hamster, and these books are (to borrow a phrase form him) GREAT-GREAT-GREAT. They are funny, and interesting without being scary. As an added bonus, they address issues that are relevant to elementary school age kids, like what happens if one of your classmates is always making up stories to make himself seem more interesting, or is so shy she has a hard time making friends. I’ve linked to the first book in the series here, but we’ve enjoyed every book we’ve read so far, and we only have one or two books left before we reach the end of the series… so far. We’re all hoping Ms. Birney keeps writing more! Learn more about Humphrey at the author’s website.